Back of the Cereal Box: Oxidized or Just Out of Use? Another entry in the “Ha Ha — This Person’s Name” series, this one from Co-worker Chris, who tells me that the world of professional sports is an untapped natural resource of the unfortunately named. 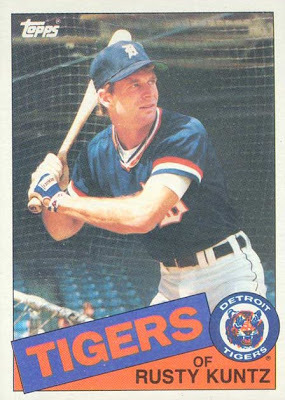 Meet Rusty Kuntz, professional baseball player from 1979 to 1985 and member of World Series-winning 1984 Detroit Tigers team. Rusty’s Wikipedia profile is careful to note that his last name is pronounced with an “oo” sound. I’m sure both Rusty and his fans have to make this correction often. It also notes that he is sometimes known to fans as “Kuntoooo” — just like that, with four O’s at the end. It seems to me that if I had the last name “Kuntz” I’d try for a nickname that didn’t include any form of it. Ha! That made me laugh once I read it right; I went dyslexic the first time and read it as "Knutz" which would have been equally funny. I feel like such a child, I can't stop laughing at this name. And it's stuck in my head. It's evident how I'm going to be spending the rest of the night.